Maximize your children’s mindfulness and relationship with food for a more enjoyable food environment for your family! We all want our children to eat healthy meals. We want them to eat more fruits and vegetables, to like whole grains, to eagerly chomp down on fish and other healthy proteins, and to drink more milk. AND we hope that they will eat less candy and avoid soda. The ultimate goal is for them to form a healthy relationship with food with no fear of new foods or obsessions with habitual ones. In an attempt to achieve a lot of this, many parents form their definition and checklist of healthy foods and start to make food rules. 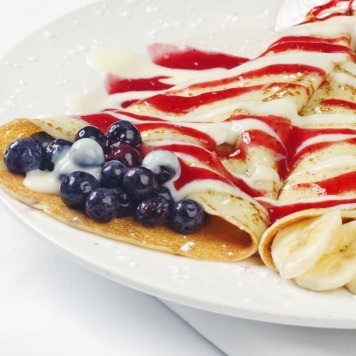 No sugar, no candy, no preservatives, are only a few of the many that we’ve heard! It might seem like quite a task at a glance, but taking things in stride and focusing on a few key steps one at a time is effective and will help you and your kids form even better relationships with food! 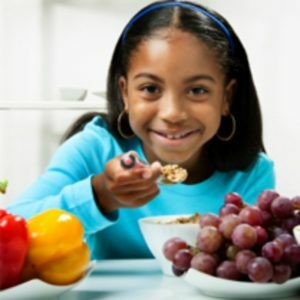 Your role is to use mindful eating techniques to help your children self-select healthier foods. Set your child up for success by practicing these strategies! Accept that each person is different and unique, including your child. There’s no right or wrong way of eating, but rather, a variety of ways and food experiences. Teaching your child to eat healthfully and mindfully can start as early as toddlerhood. While mindfulness seems like a new health trend, your child is born a pro. Infants and toddlers are connected to their senses; they look, feel, smell, and taste their food before they eat. The younger the child, the closer he is to mindful eating. Keep in mind that preferences and awareness may change over time, even as adults! To navigate this in the healthiest way possible, awareness is key. This will set you up for a more balanced viewpoint on what is best for your child and for yourself. Consider the concept of Division of Responsibility. This is new to some parents and difficult to adopt for others, so consider how you can apply this concept with your child. It may take time to feel like you have it down, so be patient and positive throughout the experience! Toddlers are learning colors, shapes, and textures, and food is the perfect teaching tool. During conversations, discuss what a healthy food is. They don’t have a big understanding of health, so start with the basics. Instead of classifying food into good and bad, teach them to think of a healthy food as something that will help them grow, get tall, become strong, play more, or run fast. Take it a step further by deciding to Give Your Family’s Diet an Honest Look. Get your child involved in food selection and meal preparation. Comfort foods are taking shape, and habits your children develop now will stay with them for years after. Make sure you are doing what you can to make sure these are good habits! Make meal times for meals only. While it’s tempting to turn the TV on or feed your child when he’s playing, try to avoid doing so. One of the principles of mindful eating is to direct all awareness to the feeding experience. Give him utensils and let him eat on his own (don’t stress about the mess with your little ones!). At least once a day, eat meals together as a family. For younger kids, bring the highchair close to the table, or remove its tray and let your child use the family table. Your actions and attitudes matter. Children who fear trying new foods usually have mothers who do too, and children who are picky with vegetables might have mothers who don’t vary their vegetable intake. Children want what their parents have, so make sure you are eating healthy foods to nourish your body too. Be aware of how you think of or label foods to avoid being judgmental. 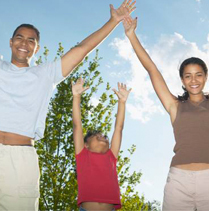 Work on your parent role modeling daily to make sure you’re doing the best you can be doing! Don’t reward eating a healthy food with something that is not. “If you don’t eat your vegetables, you can’t have dessert.” That implies he has to eat something nasty or causes discomfort to get something that is sweet, delicious, and triggers joy. This does not encourage your child to love eating vegetables. It also makes him attach happiness and success to unhealthy foods. Instead, make fruits and vegetables festive, reward with fun activities or special attention, and offer dessert occasionally, detached from eating any other food! Learn more about avoiding food as a reward. Be patient and continue to offer a variety of foods. When your child refuses to eat something, ask her why. Help her acknowledge what caused her response: is it taste, smell, texture, or temperature? Remember that it takes 10 to 15 times for children to trust and try a new food. Offer it in different cooking methods, shapes, temperatures, and offer something that looks good. Let her move it around on her plate, and she will eventually make that jump from a food in her hand to a food in her mouth. Create too many unattainable rules you can’t keep and end up with power struggles with your child. Be strict about the rules and risk raising a child that fears or over-control his intake. While general guidelines help nourish your family, be careful not to go overboard. Remember that your child is developing impressions and attitudes towards food. Instead of countless rules, stick to a simple one: if you ate it once today, you can’t eat it again. They won’t eat the way you want all the time. Have an occasional treat, and allow your child to experiment with all foods. Most importantly of all, don’t take the pleasure out of food. Create healthy eating memories, and at the same time, don’t surrender or become a short-order cook. If they don’t eat what you’ve offered for one meal, hunger will eventually kick in. It is all about trial and error, with patience and flexibility. At the end of the day, you and your children will be happier! Nour is a registered dietitian nutritionist. She specializes in functional nutritional therapies and coaching for digestive health, weight loss, diabetes, cardiovascular disease, food sensitivities, migraines and headaches, fatigue, fibromyalgia, eczema, hyperactivity, and autism. She sees patients in her office in Herndon, Northern Virginia, and offers coaching through phone and Skype. Nour has intensive functional nutrition training and constantly attends conferences and workshops to gain more knowledge and skills to better help her patients. Nour has been interviewed paper and online publications. When not working, Nour likes to have a good time with family and friends. Whenever possible, she’d rather be under the blue sky.